Observation - Tunicate - UK and Ireland. 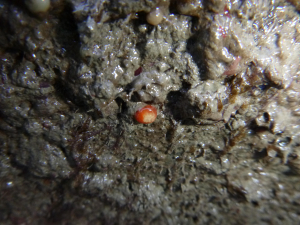 Description: Small (3mm diam) tunicate with orange test, with about 10 whitish bodies (presumably zooids) within. Very small central vent visible, but not possible to see any other openings even at x40. Dark brown spots around test, mostly fairly evenly spaced. Small (3mm diam) tunicate with orange test, with about 10 whitish bodies (presumably zooids) within. Very small central vent visible, but not possible to see any other openings even at x40. Dark brown spots around test, mostly fairly evenly spaced.